OVERLAND PARK, Kansas - June 10, 2018 - Bushnell, an industry leader in high-performance optics, announces the signing of World Champion Shooter Jessie Harrison to Bushnell’s Ambassador/Shooting Team. She will represent Bushnell at Steel Challenge, USPSA, Bianchi Cup and IPSC matches, as well as assist with the development of new products. The first female shooter to achieve Grand Master status with the U.S. Practical Shooting Association (USPSA), Harrison boasts an impressive list of accolades across five shooting disciplines, including multiple World and National Champion shooting titles. Among these are the prestigious Bianchi Cup and the World Speed Shooting Championships. Harrison began shooting competitively in Cowboy Action Shooting tournaments at the age of 15. She soon added multiple disciplines, including USPSA and Steel Challenge, then Multi-Gun and the NRA Bianchi Cup. Today, she is one of the most awarded shooters of all time, with dozens of World and National Championship titles to her credit. 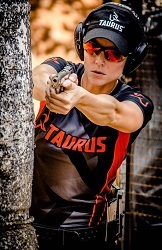 She recently captured her 20th USPSA Ladies National Title. For more information on Harrison, check out her Facebook fan page at https://www.facebook.com/jessielharrison/.